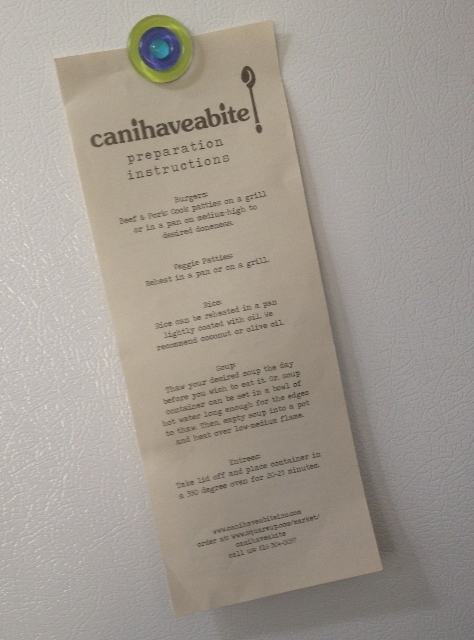 canihaveabite creates a weekly menu of delicious dishes made for you to enjoy at home! 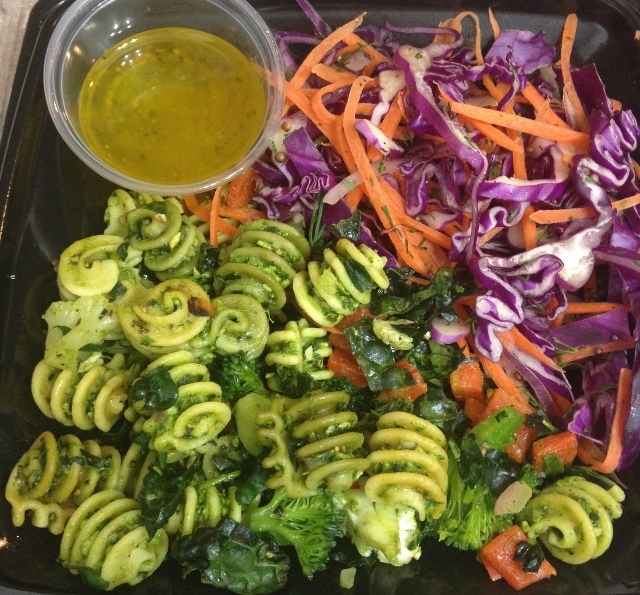 All of their dishes are made from organic and local ingredients and are available for delivery in some parts of Kansas City and pick up for those outside of the delivery area. It’s super simple: you select the dishes you would like from their on-line menu, add them to the cart and pay. Then you either get a delivery on Monday or you make a quick drive to pick it up. And by quick drive, I mean my drive to pick up a week’s worth of lunches and dinners took me less time than I usually spend making one dinner. Super easy! I have wished for a meal delivery service I could feel comfortable referring my friends to, one that I knew for certain was gluten-free, one that used produce from farmers that I know, farmers who I have featured in my own classes. I had even done some looking around on-line to see if there was a company from out of town that would ship food to me while this kitchen-remodeling-project-that-just-won’t-end mess is going on. I found nothing that could accommodate me being both gluten-free and vegetarian. I was about to give up and resort to frozen dinners when I found out about canihaveabite. From that discovery, I sent a Facebook message to canihaveabite and got a prompt reply and answers to my numerous questions. I have to be super duper careful about gluten. I don’t eat meat. How much food is enough for me and my fella? 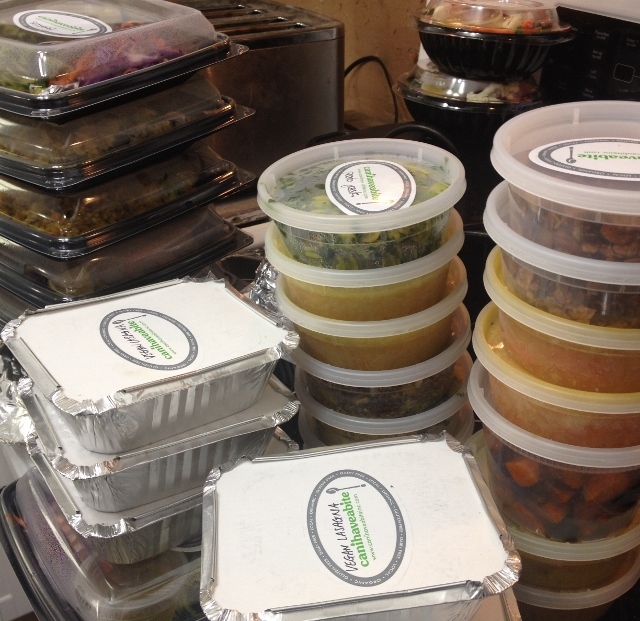 All of my questions were quickly answered, I placed my order online and picked up a week’s worth of food on Monday. The price wasn’t much more than what we would spend on groceries. There were plenty of vegetarian options to keep things interesting for the week and every single option is gluten-free, so no worries about keeping me healthy. Along with our order, instructions on how to heat the dishes. I stuck this on the fridge for easy access all week. 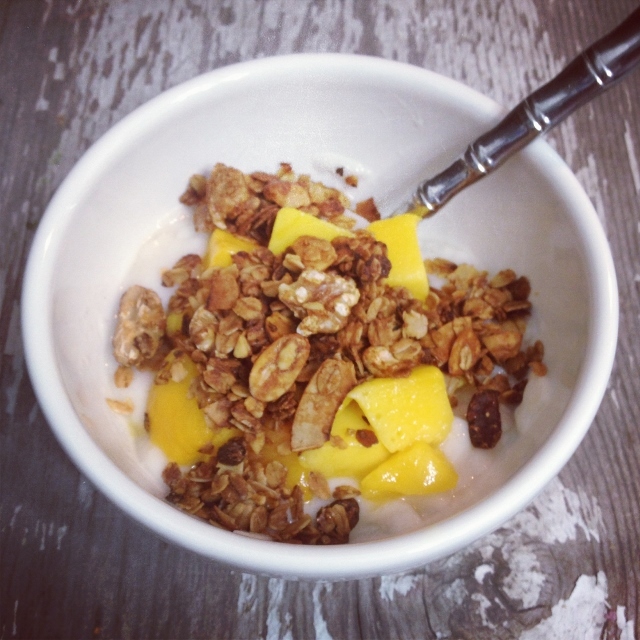 We were treated to a few extra goodies in our order, including homemade granola. I had it atop coconut yogurt and mango chunks for breakfast. I am not usually a fan of granola. I’m now a fan of granola, or at least the canihaveabite granola. It’s packed with nuts, oats and warm spices. Lunches were incredibly tasty and very filling. We tend to eat a bigger lunch than dinner here, so this worked well for us. 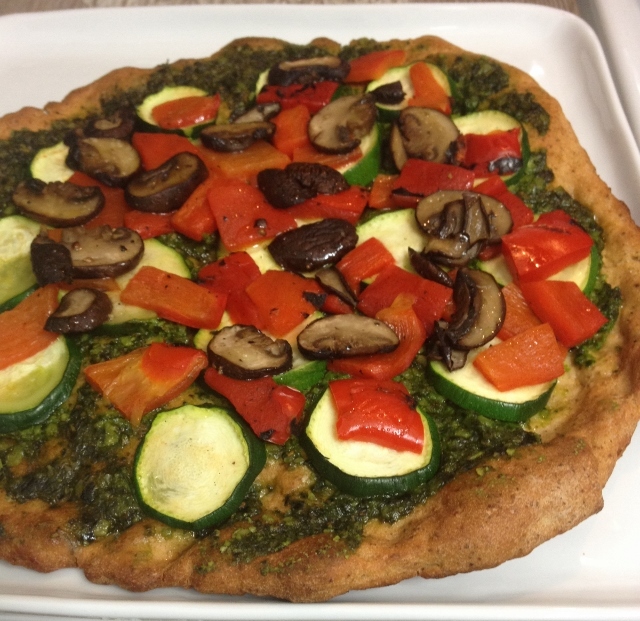 The Italian lunch featured a vegan pizza with pesto and a slightly sweet crust. I could eat this often! The Mediterranean lunch was my favorite! 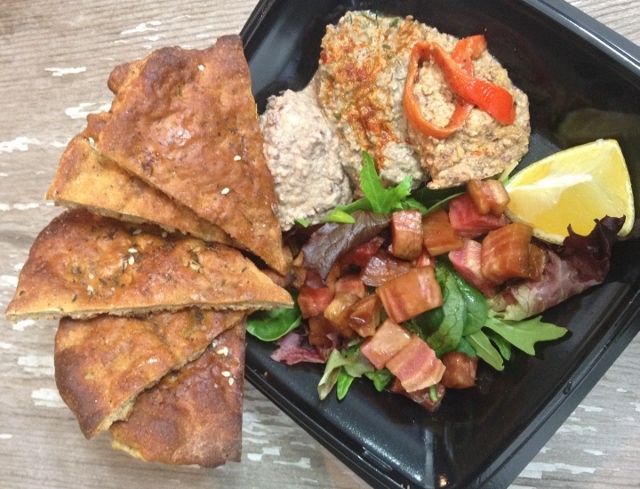 Gluten-free pita wedges with three varieties of hummus and a salad with roasted golden beets. Dinners were also very good! We had a Vegetable Cassoulet, Shepherd’s Pie and Vegetable Lasagna. We also had veggie burgers one evening. We had a few side dishes to go with our entrees, including Cumin Roasted Sweet Potatoes and a hearty quinoa dish. While not big soup eaters, the soups from canihaveabite could change that! We both really enjoyed the smoky flavor of the Taos Green Chili. 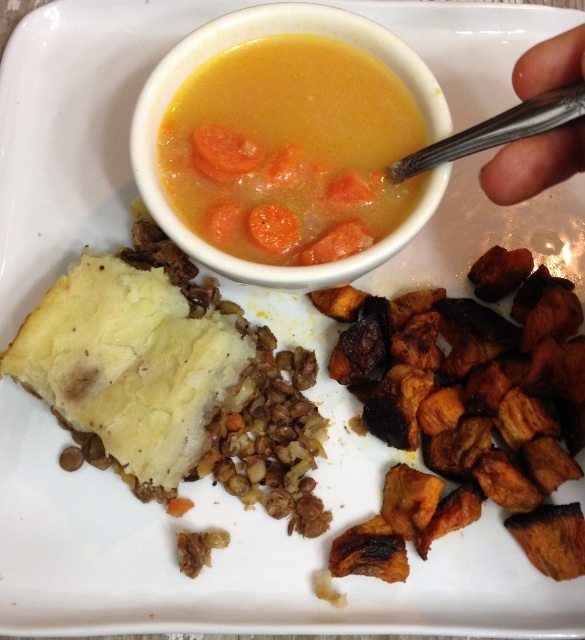 The Carrot Lemon Lentil was not expected to big a big hit here, but again, we both really enjoyed it. The biggest hit in soups though was the Curry 2Way. I was so disappointed when it was all gone, thinking just one more bowl would soothe my craving for that soup. So good! 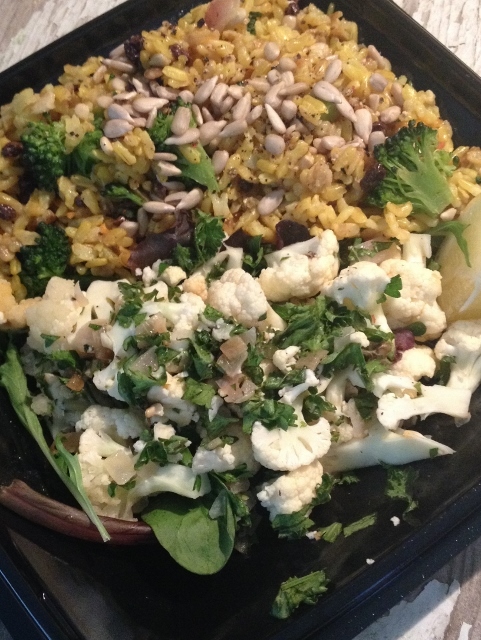 One more tasty surprise was in our package of healthy, delicious food from canihaveabite. 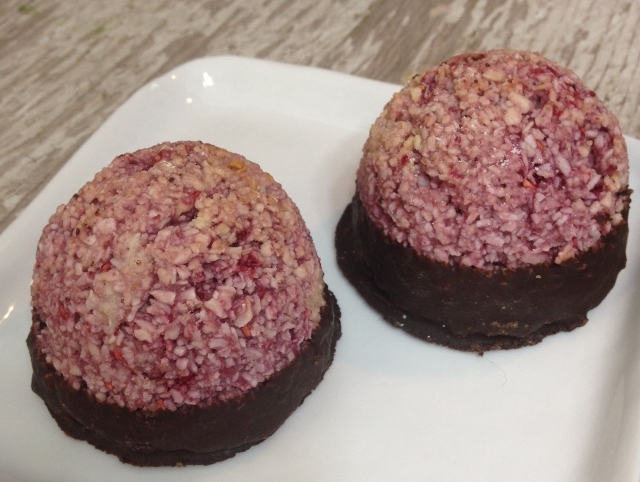 These berry coconut macaroons, dipped in chocolate, were dangerously good. Just the right amount of sweet and a very generous size to soothe the most incessant sweet tooth. Not ready to order food for delivery yet? Need a little convincing? canihaveabite’s soups are served at The Filling Station and they also sell their entrees, hummus and goodies like the macaroons shown above at Bad Seed Market on Friday evenings. Wanna know what I did at the end of our week of food from canihaveabite? I ordered a second week of meals! I intended to try a week to tide us over while the work on the kitchen continued. Now that our kitchen is a bit more functional, I could cook very basic meals but instead, I decided to order again. The food is flavorful, I’m eating meals that are made with healthy, local ingredients where possible and everything is gluten-free. It’s the perfect solution for eating well when busy, not interested in cooking or remodeling a kitchen. I’ll keep coming up with excuses to enjoy these meals! canihaveabite is located in Kansas City, MO. You can order on-line or call 816.304.0057. Eat With: Minimal caution. They know their ingredients and choose with care. 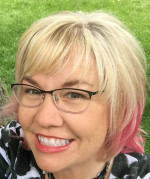 Super knowledgeable about gluten-free and dairy-free! Recipe or it didn’t happen, Robert! 😉 I’ll watch for it on your site! What a great find! Everyone needs a break from the kitchen every once in a while. It’s pretty rare to find vegetarian and gluten-free in a convenient package too! I envy all of the choices you have in NYC, Heather, but am tickled to have found this. And it’s super delicious so I am allowing myself to enjoy the kitchen break.